The Baby Blogs: Shabbat Shalom ... Again! Today I did the blessing at school (kiddush). Amen! This week's school activities also included a bouncy castle! All in all, a most interesting week at Shalva! Have a good weekend everyone! 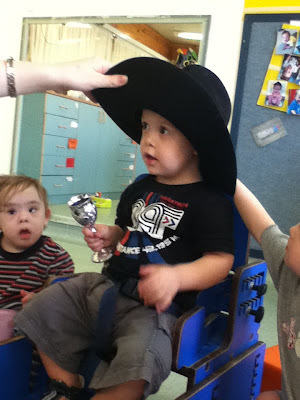 I love that he is holding the Kiddush cup. This is so funny how they teach them Shabbat. HAHA!!! Anyway, Go Daniel. See you in a month!! !